For Insertion into a ball valve for connecting 1/2" ID line. Made from 304 type stainless steel. Please note: If using 1/2" ID vinyl tubing, we recommend using hot water to heat the tubing up for easier insertion. Not recommended for use with thick wall 1/2" vinyl tubing. Got it for my pump connection. What is the OD of this barb 1/2" or 5/8"? Does 1/2" silicone tubing fit loose or tight on it? I want a "snug" fit and use a hose clamp, not a tight fit and struggle to remove the hose from the barb. Trying to determine if I need 3/8" or 1/2" barbs. BEST ANSWER: OD is a little larger than 9/16". The fit is snug on H985, our 1/2" silicone tubing. Worked perfectly but the description is confusing and incorrect. It is 1/2” MPT and with 1/2” barb. Fits 1/2” silicon tubing. Its a SS barb fitting.. works as expected. I use these on most of my connections with no leaks. Highly recommended ! well built great fit!! I use these on my kettle and pump setup with no issues. They hold well to the silicone tubing I use. Been using this for a while on the ball valve off my kettle for draining the wort to the fermenter. No problems. Works as advertised. Sizing is correct and material quality is great. 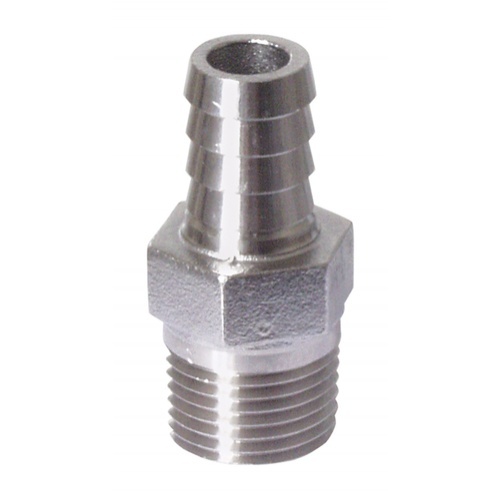 This is a high quality fitting that installed with ease. It came with teflon tape on it, I gave it a little turn with a wrench and it's perfect. Not a lot to say. It's SS and will last forever. Buy it. Very heavy and holds tubing on cold or hot. Stainless barb looks still looks fantastic after many brews. Does what it's supposed to do. Stainless works great. Use some Teflon tape and you are ready to go. Works great with high flow...what more could you want. This is a simple fitting, however if you're going to build something for your brewery and are looking at long term design and usage....get stainless! There is a reason that it is used in sanitary conditions and it lasts as long as you do. I eventually just put quick disconnect on everything but these are nice. Stainless quality is great after 8-10 uses. Soak in pbw does the job. Still like new, quality of machining is great. I use these on all of my valves, and will be buying them for my pump. Decent price for stainless. Not using stainless stell fittings is like a swift kick in the brass! Nicely made fitting, ships with the teflon tape for a good extra touch. what more can I say, it does it's job. It's stainless & it lets you connect tubing to your kettle or anything else that has a 1/2" mpt connection. If you're contemplating brass vs stainless, go stainless. Not as reliable as camlocks, but much less expensive. Can clog if you're not careful. Is what it is, does what it should. Works well with silicon tubing for easy transferring of wort on brew day. It's a stainless threaded barb. Threads on to 1/2" ball valve and connect outlet tubing. Does its job. Get one. Great quality, works perfectly. Cheap enough to make it a no brainer. You need one of these for your kettle, so may as well go stainless. Excellent quality at a great price, no sense in going with brass. It is just as advertised. I pull my assembly apart after every use for a through cleaning and it goes back together leak free every time. These are as advertised. Good product that will last forever. Its one of those, "if you need it you need it" items. Inexpensive enough that I replaced all my brass with stainless steel for a tougher finish that looks better, too. "Grabs" and hangs onto the hose very well and with a little pipe tape on the threads, is leak free. A barbed end for a hose is just what you need as a homebrewer. For less than $5 each, it's a good value. Bought a March pump and these fittings are cheap and necessary to adding it into your brewing system. Stainless and easy to attach. These are some great quality 304 stainless fittings. I bought 2 for hooking up my pump and whirlpool chiller, and am very pleased with the smoothness of the barbs and thread pitch and quality. They fit my pump and other fittings extremely well. I bought this to replace the brass fitting on my pump. The larger diameter is perfect for hops and grain to go through and works well with the 1/2" silicone tubing.